عباس زاده, عباس, عبدی, علیرضا. (1396). چالش کمبود پرستار؛ تهدید جدی برای نظام سلامت: یک مطالعه مروری. سلامت جامعه, 9(1), 37-47. عباس عباس زاده; علیرضا عبدی. "چالش کمبود پرستار؛ تهدید جدی برای نظام سلامت: یک مطالعه مروری". سلامت جامعه, 9, 1, 1396, 37-47. عباس زاده, عباس, عبدی, علیرضا. (1396). 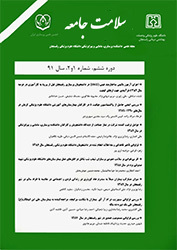 'چالش کمبود پرستار؛ تهدید جدی برای نظام سلامت: یک مطالعه مروری', سلامت جامعه, 9(1), pp. 37-47. عباس زاده, عباس, عبدی, علیرضا. چالش کمبود پرستار؛ تهدید جدی برای نظام سلامت: یک مطالعه مروری. سلامت جامعه, 1396; 9(1): 37-47. 2دانشگاه علوم پزشکی شهید بهشتی (شعبه بین الملل)، تهران، ایران. مقدمه: پرستاران گروه اصلی ارائه­دهنده خدمات درمانی محسوب می­شوند و کارآمدی نظام سلامت به فعالیت آنها بستگی دارد. با توجه به کمبود نیروی پرستاری به عنوان یک چالش جهانی، این پژوهش با هدف بررسی مفهوم کمبود پرستار، دلایل این مشکل؛ پیامدها و راهکارهای رفع آن انجام گرفته است. مواد و روش ­ها: این مطالعه به صورت مروری و با استفاده از منابع علمی در پایگاه داده­های PubMed، Science Direct ، SID، Google scholar و گزارش سازمان­های معتبر علمی از سال 2000 تا 2014 انجام گرفته است. یافته ­ها: مفهوم کمبود پرستار برحسب حیطه کار و منطقه جغرافیایی فعالیت، به تعادل عرضه و تقاضای نیرو در آن جامعه بستگی دارد. مهمترین دلایل کمبود پرستار، تغییر مشخصات دموگرافیگ در جمعیت هدف، پیدایش بیماری­های جدید و نوظهور، مهاجرت و نبود سیاست­های دقیق جذب و ابقای پرستاران ذکر شد. پیامد­های کمبود نیروی پرستاری شامل افزایش حجم کار پرستاران، نارضایتی شغلی، افزایش خطای حرفه­ای، ترک محل­کار و مرگ ومیر بیماران بودند. اقداماتی مانند افزایش جذب دانشجو، تغییر سیاست­های استخدام، تمرکززدایی از مراکز درمانی و افزایش حقوق و مزایای پرستاران به عنوان راهکارهای مقابله با کمبود پرستار بیان شده است. نتیجه­ گیری: براساس یافته­های این مطالعه، کفایت نیروی پرستاری در مراکز بهداشتی و درمانی ارتباط مستقیمی با رضایت بیماران، و کاهش عوارض و مرگ و میر آنها دارد، لذا با شناسایی عوامل کمبود پرستار در یک جامعه و تدوین سیاست­های جامع برای جذب و ابقای این نیروها، گام مهمی در راستای تقویت نظام سلامت برداشته می­شود. 1Faculty of Nursing and Midwifery, Shahid Beheshti University of Medical Sciences, Tehran, Iran. Introduction: Nurses are considered to be among the most important groups in providing health services, and effectiveness of the health systems is dependent on the optimal activity of this profession. Regarding nursing shortage, as a world challenge, this study aimed to assess the nursing shortage concept, the reasons and consequences behind this problem and strategies to solve it. Material and Methods: This review study was performed using authentic scientific resources in the data bases of PubMed, Science Direct, SID and Google Scholar and reports of scientific organizations during 2000-2014. Results: Nursing shortage concept was varied based on the work scope and geographical region, and depended on the balance of supply and demand of forces. The main reasons for nursing shortage included the change in demographical characteristics of people, emerging of new diseases, emigration, and failure in policies related to recruitment and retention of nurses. The outcomes of nursing shortage included increasing workload, job dissatisfaction, high professional error, leaving the work place and mortality of patients. To overcome nursing shortage, issues such as increasing student recruitment, changes in employment policies, decentralization of health systems and increasing salary of nurses had been expressed in the studies. Conclusion: Based on the results of this study, adequacy of nursing forces in the healthcare system has a direct relationship with patients’ satisfaction and reduction of mortality rates. Therefore, by identifying nursing shortage factors and developing comprehensive policies about staff recruitment and retention a step forward in resolving nursing shortage and strengthening the health care system will be taken. Zarea K, Negarandeh R, DehghanNayeri N, RezaeiAdaryani M. Nursing staff shortages and job satisfaction in Iran: Issues and challenges. Nursing & health sciences 2009; 11(3):326-31. Aiken LH, Clarke SP, Sloane DM, Sochalski JA, Busse R, Clarke H, et al. Nurses’ reports on hospital care in five countries. Health affairs 2001;20(3):43-53. Morgan D, Somera P. The Future Shortage of Doctoral Prepared Nurses and the Impact on the Nursing Shortage. Nursing administration quarterly 2014;38(1):22-6. Parfitt B. Family health nursing: Role development in Europe. Applied Nursing Research 2007; 20(2):100-2. Yamashita M, Miyaji F, Akimoto R. The public health nursing role in rural Japan. Public health nursing 2005;22(2):156-65. Riccio C, Sommaruga M, Vaghi P, Cassella A, Celardo S, Cocco E, et al. [Nursing role in cardiac prevention]. Monaldi archives for chest disease= ArchivioMonaldi per le malattie del torace/Fondazioneclinica del lavoro, IRCCS [and] Istituto di clinicatisiologica e malattieapparatorespiratorio, Universita di Napoli, Secondo ateneo 2004;62(2):105-13. Berkery E, Tiernan S, Morley M. The relationship between gender role stereotypes and requisite managerial characteristics: the case of nursing and midwifery professionals. Journal of nursing management 2014;22(6):707-19. Makaroff KS, Storch J, Pauly B, Newton L. Searching for ethical leadership in nursing. Nursing ethics 2014; 21(6):642-58. Lim JY, Noh W, Kim E, Choi KW. A Review of the Present State and Future Policy Alternatives for Home Visit Nursing Services in Korea. Public Health Nursing 2014;31(4):354-62. Bellot J. Nursing home culture change: What does it mean to nurses? Research in gerontological nursing 2012;5(4):264-73. Immonen I. Nursing during World War II: Finnmark County, Northern Norway. International journal of circumpolar health 2013;25(72):1-6. Sloand E, Ho G, Klimmek R, Pho A, Kub J. Nursing children after a disaster: A qualitative study of nurse volunteers and children after the Haiti earthquake. Journal for Specialists in Pediatric Nursing 2012;17(3):242-53. Yin T. Future trends in school health nursing. Hu li zazhi The journal of nursing 2005;52(2):5-9. Hudspeth R. Staffing healthy workplaces: Some global nursing shortage issues. Nursing administration quarterly 2013;37(4):374-6. Lin C-F, Huang C-I, Kao C-C, Lu M-S. The Nursing Shortage and Nursing Retention Strategies in Taiwan. Hu Li ZaZhi 2013;60(3):88-93. McMurtrie LJ, Cameron M, OLuanaigh P, Osborne YT. Keeping our nursing and midwifery workforce: Factors that support non-practising clinicians to return to practice. Nurse education today 2014; 34(5):761-5. Duvall JJ, Andrews DR. Using a structured review of the literature to identify key factors associated with the current nursing shortage. Journal of Professional Nursing 2010;26(5):309-17. Cochran JH. A physician prescription for the nursing shortage. The Permanente journal 2010;14(1):61-3. Saeed A. Wanted: 2.4 million nurses, and that’s just in India. Bull World Health Organ. 2010; 88(5):327-8. Farsi Z, DEHGHAN‐NAYERI N, Negarandeh R, Broomand S. Nursing profession in Iran: an overview of opportunities and challenges. Japan Journal of Nursing Science 2010;7(1):9-18. Khosravan S, Mazlom B, Abdollahzade N, Jamali Z, Mansoorian MR. Family participation in the nursing care of the hospitalized patients. Iranian Red Crescent Medical Journal 2014;16(1): e12686. Cortese CG. Predictors of intention to leave the nursing profession in two Italian hospitals. Assistenzainfermieristica e ricerca: AIR 2012;32(1):20-7. Toh SG, Ang E, Devi MK. Systematic review on the relationship between the nursing shortage and job satisfaction, stress and burnout levels among nurses in oncology/hematology settings. International journal of evidence-based healthcare 2012 Jun;10(2):126-41. Buchan J, Aiken L. Solving nursing shortages: a common priority. Journal of clinical nursing 2008 Dec; 17(24):3262-8. Littlejohn, L .Campbell J, C-MJKT. Nursing Shortage: A Comparative Analysis. International Journal of Nursing2012; (1):7-22. Ministry Of Health and Medical Education (MoMHE) Deputy for nursing. Nurses statistics of the country. 2013. McMurtrie LJ, Cameron M, Oluanaigh P, Osborne YT. Keeping our nursing and midwifery workforce: factors that support non-practicing clinicians to return to practice. Nurse Education Today 2014 May; 34(5):761-5. Nasrabadi AN, Lipson JG, Emami A. Professional nursing in Iran: an overview of its historical and sociocultural framework. Journal of Professional Nursing 2004 Nov; 20(6):396-402. Noroozian M. The elderly population in iran: an ever growing concern in the health system. Iranian journal of psychiatry and behavioral sciences 2012; 6(2):1-6. Grady PA. Advancing the health of our aging population: a lead role for nursing science. Nursing Outlook 2011 Jul; 59(4):207-9. Ross SJ, Polsky D, Sochalski J. Nursing shortages and international nurse migration. International Nursing Review 2005 Dec; 52(4):253-62. Duffield C, O'Brien-Pallas L. The causes and consequences of nursing shortages: a helicopter view of the research. Australian Health Review 2003; 26(1):186-93. Stringhetta F, Dal PA, Palese A. [The evolution of nursing shortage and strategies to face it: a longitudinal study in 11 hospitals]. Assistenzainfermieristica e ricerca: 2012 Oct; 31(4):200-6. Pascale Carayon, AyseP.Gurses. Chapter 30Nursing Workload and PatientSafety—A Human Factors Engineering Perspective. Patient Safety and Quality: An Evidence-Based Handbook for Nurses. 2008. p. 203-16. Mosadeghrad AM. Occupational stress and turnover intention: implications for nursing management. International journal of health policy and management 2013 Aug; 1(2):169-76. Twigg D, Duffield C, Thompson PL, Rapley P. The impact of nurses on patient morbidity and mortality - the need for a policy change in response to the nursing shortage. Australian Health Review 2010 Aug; 34(3):312-6. Salsali M, Mehrdad N. Iranian nurses' constraint for research utilization. BMC Nursing 2009; 8:9. Bostrom AM, Kajermo KN, Nordstrom G, Wallin L. Barriers to research utilization and research use among registered nurses working in the care of older people: does the BARRIERS scale discriminate between research users and non-research users on perceptions of barriers? Implementation Science 2008; 3:24. Aiken LH, Clarke SP, Sloane DM, Sochalski J, Silber JH. Hospital nurse staffing and patient mortality, nurse burnout, and job dissatisfaction. JAMA 2002 Oct 23; 288(16):1987-93. Aiken LH, Clarke SP, Sloane DM. Hospital staffing, organization, and quality of care: Cross-national findings. Nursing Outlook 2002 Sep; 50(5):187-94. Clarke SP, Sloane DM, Aiken LH. Effects of hospital staffing and organizational climate on needle stick injuries to nurses. American Journal of Public Health 2002 Jul;92(7):1115-9. Clarke SP, Rockett JL, Sloane DM, Aiken LH. Organizational climate, staffing, and safety equipment as predictors of needle stick injuries and near-misses in hospital nurses. American Journal of Infection Control 2002 Jun;30(4):207-16. Cheryl Bland Jones MG. The Costs and Benefits of Nurse Turnover: A Business Case for Nurse Retention. The Online Journal of Issues in Nursing 2007;12(3). Jones CB. The costs of nurse turnover, part 2: application of the Nursing Turnover Cost Calculation Methodology. Journal of Nursing Administration 2005 Jan; 35(1):41-9.